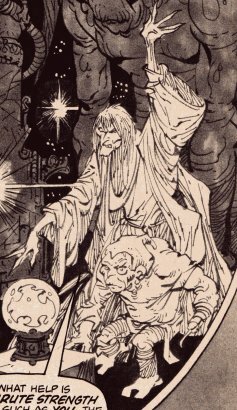 Group Membership: Former king of "Warnlin"
Powers/Abilities: Chen K'an was a powerful sorcerer, able to fire powerful mystic blasts, form shields, open dimensional or space portals, project his astral self, observe distant events, and perform a number of spells. 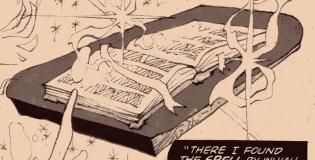 He could access greater power using magic talismans such as the Book of Eternity and the Star of Catalax. (Rampaging Hulk I#4 (fb)) - "Warnlin" was once "the most magnificent jewel to adorn the crown that is our galaxy." It was a dream world of perfection; its people's every need tended to, leaving their vital energies for exploring higher mind. Chen K'an was the world's king, and he was made whole by his lover. He knew there were dark forces that wished evil upon his kingdom, but it had been so long since they had tried anything that his guard was down. During the deepest astral meditation he had ever achieved, the dark mage Lyissa and her allies struck, severing the divine spinal light that allowed Chen K'an's astral and mundane forms to reunite. For what seemed like eons, he searched the endless astral corridors, at last finding the Book of Eternity. Within it he found the spell by which he could bridge the worlds above and below and recall the cloak of his corporeal form. Chen K'an was devastated to find that his world had become a land of savage barbarians, ravaged by mutations and unholy cannibals, and that his lover was dead. (Rampaging Hulk I#4) - Chen K'an cast a spell, asking the gods to show him what he needed to save "Warnlin." 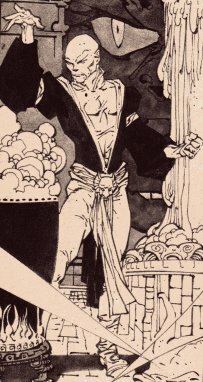 He glimpsed Bruce Banner working in one of his Desert Labs and transported him to his palace, placing Banner's intellect in control of the Hulk's form, though the Hulk retained his brash personality (a close approximation of the gray Hulk), and asked him to help recover the Star of Catalax (and reminding the Hulk he was his only means of returning home). Chen K'am led the Hulk towards her base, Tyroc, explaining his past history en route. They were attacked by a winged demon horde, which the Hulk swiftly dispatched, while Chen K'an conserved his power for the final battle. Continuing on, they encountered a monstrous cannibal, and Chen K'an was so disgusted that he obliterated the cannibal with an energy blast, squandering his power. As they approached what was once a beautiful lake, now a dank swamp, and they were assaulted by the behemoth Gyrahn. After Gyrahn punched down the Hulk, Chen K'an tried to use only a small amount of his power against their foe, but found it utterly useless. Ultimately the Hulk pulled Gyrahn into the swamp and apparently slew him. As they approached Tyroc, Lyissa opened a portal and summoned "those who lurk in those black worlds," and -- endless in number, incapable of dying, and unquestioningly obeying Lyissa who controlled the seals (portals?) -- they attacked Chen K'an and the Hulk. The Hulk fought relentlessly, occupying them and allowing Chen K'an to confront Lyissa. Though he had led everyone to believe his powers had been stripped, Chen K'an revealed he had just been feigning this so he would not be perceived as a real threat and so he could test Lyissa to see her power; he further explained that he had chosen the Hulk because he was incorruptible and incapable of surrender. Harnessing his might, Chen K'an then slew Lyissa (her last remaining ally, the troll Tynjo, was slain in the blast as well) and then banished the extradimensional hordes to "the dimensions beyond the dimensions." 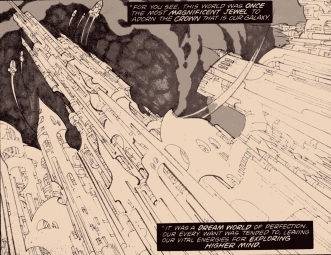 Chen K'an then led the Hulk to the Star of Catalax and told him that his world was beyond saving, and that he was going to use the Star to obliterate his homeworld to free its soul and let it fly to be born again. Sending the Hulk back home, Chen K'an also restored his normal brutish state, clouding his memory of recent events, though he allowed him to remember that somewhere he had been respected and cherished. Mouthing silent names, Chen K'an then violently melded his mind with the Star of Catalax and then screamed, the force of which spread until it shattered the planet. Comments: Created by Jim Starlin, John Warner, and Alex Nino. 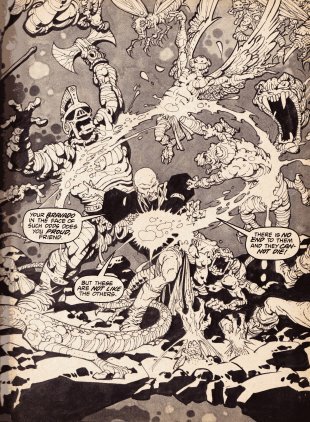 This story was part of Bereet's "The Life and Times of the Incredible Hulk," which was a techno-art fiction intended to take place during the early months of the Hulk's existence, shortly after Incredible Hulk I#6. That story parallels reality on Earth-7711. I'm tired of characters with apostrophes in their names. It's a distraction while typing. Located on some unidentified astral plane, it was located by Chen K'an and enabled him to return to his physical form despite his connection having been severed long ago by Lyissa. Following the devastation of "Warnlin," unholy cannibals roamed the land. One was encountered by Chen K'an and the Hulk en route to Tyroc. Disgusted by what had become of his world, Chen K'an squandered some of his much needed power in obliterating the cannibal. The demons were part of Lyissa's union of dark forces, and the character shown in the headshot was their leader, "fiercest of his ancient race." The leader was allied with Lyissa in ambushing Chen K'an and severing his connection to the mortal plane. They presumably ran rampant over the world thereafter, contributing to its corruption and degradation. 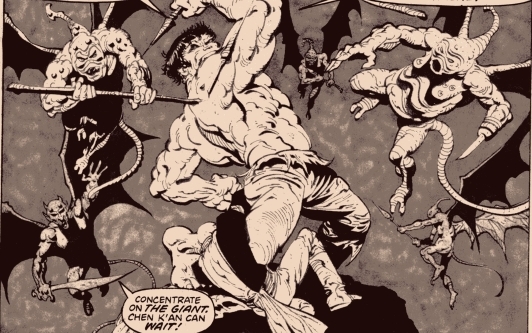 When Chen K'an summoned the Hulk and approached Tyroc, the demons were the first to confront them, but the Hulk dispatched them in short order. Gyrahn was leader and "fiercest of his ancient race" of behemoths who were part of Lyissa's union of dark forces. 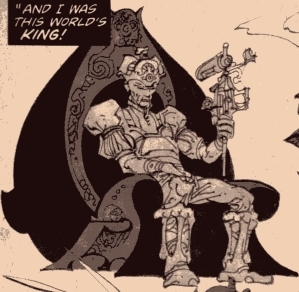 Gyrahn was presumably (he wasn't pictured) allied with Lyissa in ambushing Chen K'an and severing his connection to the mortal plane. Gyrahn and the Behemoths presumably ran rampant over the world thereafter, contributing to its corruption and degradation. After the Hulk had dispatched the demons, Lyissa sent Gyrahn after him and Chen K'an. Arising from a dank and polluted swamp, Gyrahn swatted the Hulk down and shrugged off a blast from Chen K'an who was trying to conserve his power for a later fight. 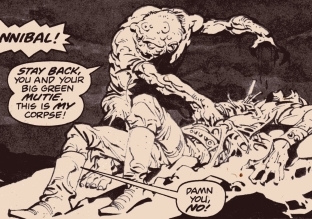 After a fierce battle, Gyrahn was eventually pulled into the swamp, overpowered, and left for dead by the Hulk. Lyissa was a sorceress, descended of the North-Elders. She was the leader of the dark forces that ambushed Chen K'an and severing his connection to the mortal plane. She allowed her forces to run rampant over the world thereafter, contributing to its corruption and degradation. She saw the beauty in evil and thought that any creative process must first be synthesized through suffering. With Chen K'an's return and summoned the Hulk, she realized that he wished to destroy everything she had worked for. She gathered the leaders of her dark forces to Tyroc, including Gyrahn of the Behemoths, Tynjo of the Trolls, and the demon-leader, and sent them against her foes, who triumphed and approached Tyroc nonetheless. Lyissa then opened a dimensional portal and summoned extradimensional hordes to attack them, but the Hulk occupied them while Chen K'an, having lulled her into believing he was virtually bereft of power, confronted her directly and obliterated her. Lyissa was a powerful sorceress, able to project blasts, form shields, open dimensional portals, and sever the connections between the astral self and the mortal body. That's Tynjo by her feet. A powerful magical energy source of unknown origin, it was held by Lyissa within the castle Tyroc. After slaying Lyissa and defeating her forces, Chen K'an used it to destroy his world, which was beyond saving. 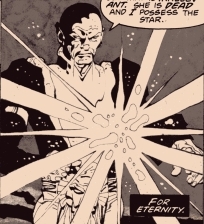 Mouthing silent names, Chen K'an then violently melded his mind with the Star of Catalax and then screamed, the force of which spread until it shattered the planet. Tynjo was leader and "fiercest of his ancient race" of trolls who were part of Lyissa's union of dark forces. Tynjo was allied with Lyissa in ambushing Chen K'an and severing his connection to the mortal plane. Tynjo and the Trolls presumably ran rampant over the world thereafter, contributing to its corruption and degradation. After the Hulk had dispatched the demons and Gyrahn, Lyissa discussed with Tynjo how they would destroy Chen K'an. Tynjo noted his and the Hulk's approach, but mostly just cowered behind Lyissa, and he was apparently slain by the energy released when Chen K'an obliterated her. Tynjo's full body can be seen in the Lyissa sub-profile. Also known as the Citadel of Terror, it was Lyissa's base. It was nearly leveled as Chen K'an slew her and banished her forces, and was subsequently destroyed when Chen K'an destroyed the whole planet.